The instructions below assume that you already have Mozilla Thunderbird configured as the email client for your Dido Internet email address. 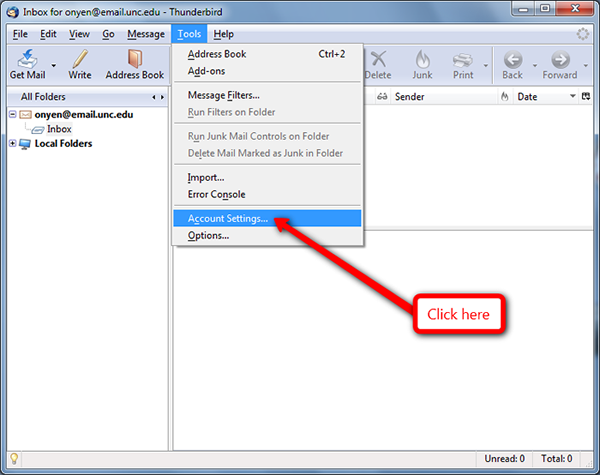 For help setting up Thunderbird as your email program, please refer to this help document. This section explains how to enable the Transport Layer Security (TLS) protocol for the Thunderbird email application. Enabling TLS in Thunderbird will improve the security of your email communication by encrypting the way Thunderbird communicates with Dido Internet’s email servers. It is recommended for all users. TLS is the successor to the Secure Sockets Layer (SSL) protocol. Thunderbird can be configured to work with either, and both will provide increased security. However, TLS provides some enhancements over SSL. These instructions use screenshots from Thunderbird version 2 for Windows. However, the procedure is similar for enabling SSL/TLS in Thunderbird V.1 or for the Apple version of the Thunderbird client. 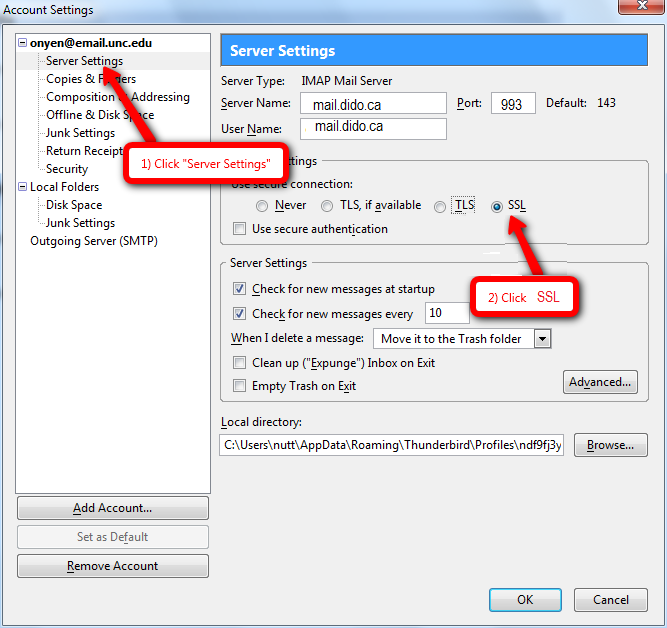 IMAP server settings for incoming email. SMTP server settings for outgoing email. With your Thunderbird client open, select Tools from the main menu. Then select Account Settings from the drop the down menu. See figure 1. This will open up the Account Settings window. If you have more than one email account configured, make sure that your Dido Internet’s account is selected on the left menu tree. Under your Dido Internet account, select Server Settings. See figure 2 below. Under Security Settings, select the radio button for TLS. The port number should be set to 143. Leave the box next to Use secure authentication unchecked. This box is unrelated to the TLS protocol that you have just enabled. If it is checked, Thunderbird will not behave correctly. 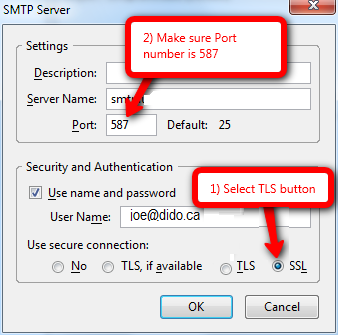 Keep the Account Settings window open for the next step: configuring your SMTP server settings for TLS. In the same Account Settings preference window that you have open, click Outgoing Server (SMTP) in the menu in the left sidebar, then click the Edit button. See figure 3 below. Under Security and Authentication, select the TLS radio button. Ensure that the Port number is 587. See figure 4 below. 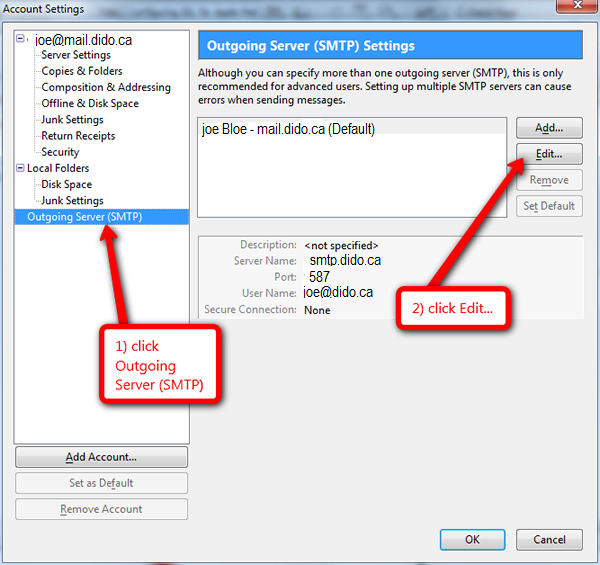 Click OK to close the SMTP Server window and OK again to close the Account Settings window.